According to the UN Food and Agriculture Organisation (FAO) and allied organisations half of all the food produced in the world is lost after production. 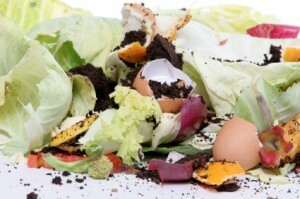 In New Zealand around 258,886 tons of food waste is dumped in landfill each year. This equates to around 64kg of food waste per person each year in NZ compared to 82kg /person/ year in the USA. Around one-third of the food we buy we throw out. While some waste is unavoidable (such as tea bags, banana skins etc) approximately 20% is avoidable such as bread crusts and plate waste. Waste in production before food even reaches the marketplace it has been graded and some has been lost through spoilage on the ground. Waste in transit occurs in fossil fuels when we factor in “the food miles” covered to transport food from paddock to plate, and then the tip. Most items on an ordinary supermarket shelf have travelled incredible distances. Research by Gaballa and Abraham found that ingredients in a typical Melbournian’s weekly shopping basket (excluding packaging) had travelled the equivalent of two round-the-world trips. The carbon pollution produced would be equivalent to that produced by almost 3,000 cars per year. Water wastage. For a high quality of living it is estimated that everyone requires around 135 litres per day for things such as cooking, drinking, hygiene, industry, agriculture etc. High end users such as Canada and New Zealand are using around 700L/person/day. We prepare, cook and eat too much and instead of recycling food we throw it out (or eat more than we need). We fail to use food up in time before it is deteriorates and needs to be thrown out. Apart from the need to minimise food wastage caused by bacterial contamination, we need to also be aware of how to minimise micro-nutrient loss (wastage) of vitamins and minerals in the home. Good food handling and storage techniques can really help. The water-soluble vitamins B and C as well as some minerals are lost when foods, particularly fruits and vegetables are heated or poorly handled. Buy foods fresh and store fruits and vegetables in the refrigerator or a cool, dark place. Cut vegetables with a sharp knife to avoid bruising them. Cook lightly and serve immediately to retain freshness. Store cut vegetables in an air tight plastic box to prevent vitamin losses through oxidation. Avoid soaking vegetables, unnecessary peeling and chopping as this leaches out the vitamins and minerals. The exception to this rule is when preparing dried beans (e.g.red, kidney or lima beans etc). These need to be soaked for up to 5 hours, then cooked in fresh water for at least 10 minutes to remove toxins they may contain before being eaten..
To put the need for these vitamins into perspective most are destroyed on contact with heat. However we only need around 30-40mgs/day. Smokers need approx. 80mgs Vitamin C/day. One raw kiwifruit contains 67mgs Vitamin C. So if you can follow the New Zealand Nutritional Guidelines that recommend 5+/day (3 vegetables and 2 fruits the size of your hand) you will be having enough. For more information regarding the effects of food processing on nutritional value read lea’s article on Can it! how nutritious are canned products? Keep oils in dark bottles, butter and margarine in covered containers. Buying milk in light protective bottles now can also help. When not in use store milk covered in the refrigerator or a cool, dark place. Avoid recycling fats and oils. Keep foods rich in these nutrients such as meat, fish, cheese, nuts covered and in a cool dry place. Become more aware of food waste around the home, work or school. Plan better before you shop, taking into account food items you may already have in the fridge or freezer. Rotate food in the fridge by bringing old foods forward from the back of the fridge or pantry and place new food at the back. Watch the “best by date” at the time of purchase and try to use it before it spoils. Don’t buy bulk buys unless you intend to use them before their “best by date”. Don’t overstock. Be careful of that bulk buys don’t increase your normal consumption of that food. A box of oranges consumed in a week instead of the normal capacity used in a month will not be a saving in food $’s. Buy local produce if possible as this reduces the “food miles” wasted when transporting foods to market. Grow your own vegetables and herbs if you can and consider forming food co-ops with friends, swapping different varieties when you have more than you need. Notice food packaging and be more aware of it’s impact on the environment. Recycle as much as you can. Plan to use up leftovers by recycling them into another meal or lunch the next day. See Lea’s Healthy ideas for family takeaway meals. Be more aware of your food handling techniques. Washing hands after using the toilet; covering foods when not in use; keeping foods chilled for as long as possible are all techniques that prolong the freshness of foods and also help to stop the spread of harmful bacteria that can lead to food poisoning. For more information see Lea’s article on Food Hygiene. Avoid over consumption by being more aware of portion size when planning or preparing food for your self or others. Overconsumption not only wastes food $’s but also health $’s trying to correct the obesity, diabetes, heart disease and other health problems that result. If you would like to assess your vitamin or mineral intake or to learn how to stop energy “wasted” by years of overconsumption then contact us today. Previous Can a high fat diet improve sports performance? What's the fuss about fructose?